I’ve photographed some big name celebrities in my photographic career. They have included world famous musicians, ex-prime ministers, various identities, but for the past 6 weeks I’ve been working on a project which has been the highlight of my photographic career. Indigo Shire Council hired me to photograph the people of Chiltern at work, rest and play as well as some of the ‘places’ that make up Chiltern. These images will be used for the Chiltern Place Making Project. I’ve been so lucky to have such a great project in my own town and discover some great locations and people. I was also lucky that each shoot seemed to lead to another shoot through simply speaking with people who would recommend certain events or people for me to contact. In some cases they even organised the logistics for me! I was amazed at how willing people were to help me out with my project and have me come along and include me in their events, homes and workplaces. I’ve photographed a range of people in the town from those who are well-known to those that have less of a local profile. I photographed a range of ages- the youngest was 3 and the oldest was 96! I went to farms, garages, workshops, sheds, halls and even got up at 3am to photograph the local bakers in action! In this short time I’ve created new friendships and connections to the town that I have lived in for over ten years but haven’t really known. I learnt so many things about myself, my town and people in general. I learnt that if you want or need something all you have to do is ask and people will help you. In saying that, sometimes you don’t need to ask, help is offered. I learnt a bit more about taking portraits while still capturing the candid, genuine personality of the person. 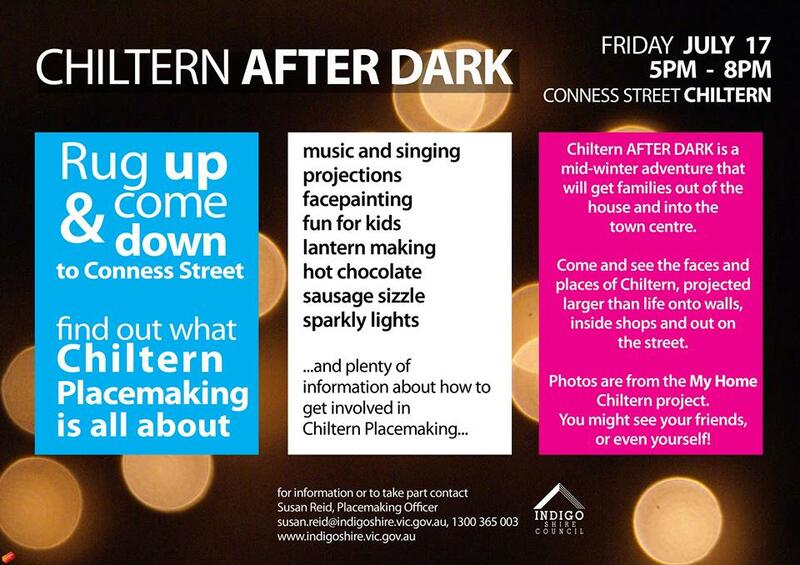 I learnt that the Chiltern community is driven by people who are good-natured and want to give back. The words I heard most often were ‘I want to give back to my community. I want to help’. Not only is Chiltern is made up of wonderfully preserved historic buildings but lots of characters and stories as well. It’s a photographer/photojournalist’s dream ! I learnt to love the natural surroundings a bit more. After being disillusioned by bureaucracy after working in natural resources for 15 years, I reconnected with the beautiful Chiltern-Mt Pilot National Park which envelops my town. The simplicity of going out with a group of passionate people to pull out weeds, observe your immediate surrounds has been invigorating. I learnt that any contribution to your community is valuable. Sharing a cup of tea with someone (or in my neighbour’s case, a long-neck of VB); sharing/swapping home-grown produce; stopping to chat with someone and genuinely being interested in what they are saying; sharing skills; spending time; volunteering to help whether it be to fight fires; rescue; provide first aid; provide meals; local sporting groups; charities; preserving and sharing history; or simply looking someone in the eye and smiling. The launch of the project is Friday 17 July at 5pm where there will be 10 installations throughout the main street of Chiltern which will be projecting images from the project. For those of you who are unable to come along I’ll post a video of the projected images after the launch. Thanks to indigo Shire Council for hiring a local photographer and the Chiltern Place Making Officer, Susan Reid for being an amazing project partner. Her enthusiasm, energy and assistance was paramount to the project success. The biggest of all thanks goes to the community of Chiltern and surrounds who helped with locations, events, had a chat with me while I wandered the streets of Chiltern camera gear in tow, made me coffees, lunches, morning & afternoon teas, included me in their groups and displayed absolute pride about their community.